The National Center on Response to Intervention. (2011). 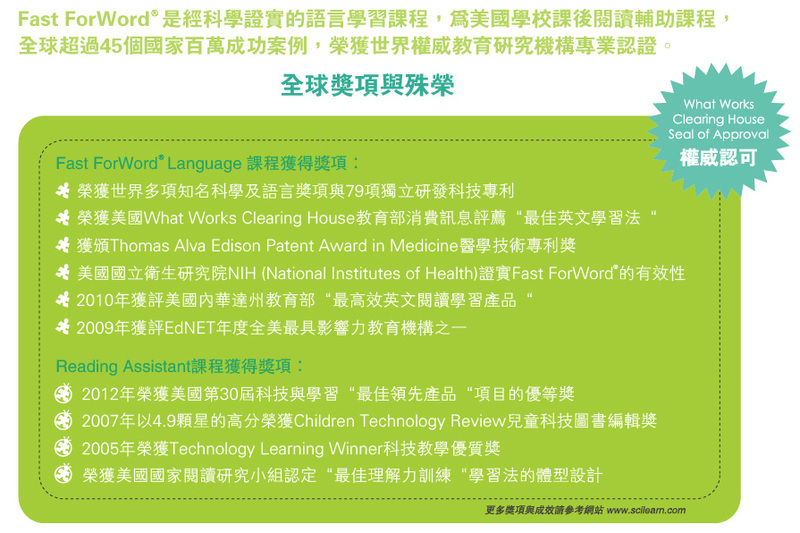 NCRTI Lists the Fast ForWord Language Series as a Successful Response to Intervention. Programs and Practices: Fast ForWord (2003). Education Commission of the States. What Works Clearinghouse (2006, September), English Language Learners: Fast ForWord Language (2006). U.S. Department of Education: Institute of Education Sciences. Fast ForWord participants from Georgia showed significant gains on the BLT, the assessment portion of Georgia’s Reading First program. Second graders in the Perrysburg Exempted Village Schools who used Fast ForWord products improved their reading fluency more than those who did not use the products. After Fast ForWord use, students in Oklahoma gained an average of ten months in reading ability and increased their reading rate by 57%. Fourth graders in South Dakota had higher oral reading fluency rates than a comparison group and greater accuracy on grade-appropriate material after using the Fast ForWord products.